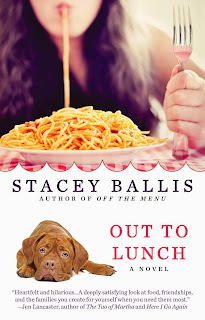 On this, the publication day for my seventh novel, Out to Lunch, I want to take a moment to thank a very special group of people...independent booksellers. These amazing people who commit themselves to the promotion of the written word and the support of authors local and national are a treasure beyond price. For many of us, it is the work of these individuals, who hand-sell our books and recommend us to their clientele, who stay open late to host us for readings and signings, that makes the difference in continuing to be a published author. Owning an independent bookstore is a labor of love, but it is a labor. It is, like any small business, long hours and fluctuating income, and often being on the brink of disaster. These people are my heroes. Because they do what they do to keep the printed word relevant, to keep the youngest among us excited about language and stories. To create opportunities for us to meet our readers who we adore. I salute every one of them, and will continue to support them in any way that I can, and in this festive season of giving, I hope that you will go to your local independent bookseller to give the gifts of stories to those on your list. With books, you literally can give someone the world, and shopping local and small you can keep our communities vibrant. I am going to celebrate my publication day by going to support a fellow writer, the incomparable Joshilyn Jackson at her signing tonight at one of Chicagoland's best indies, Anderson's Bookstore in Naperville. Next week, I will officially launch Out to Lunch at The Book Cellar in Lincoln Square. And I will be shopping at both of those as well as my neighborhood treasure City Lit Books for my holiday gifting. Thank you one and all for your happy wishes on my publication day. now go forth and shop local and independent! To late--my copy arrived today, because I pre-ordered it from Amazon. But I'm still so excited! Nice to meet you last night, Stacey. And I'll be heading back to Anderson's for my copy. Will you be doing a book tour?